Ready to offer something different at your next event or family gathering? Let us take care of the food so you can enjoy the rest! Delivery and setup charges may apply. Please call the store for more information. You can order the sandwiches pre-wrapped, you can choose to leave the sauce on the side or you can also have everything separate to allow guests to make their own gyro. All pitas, toppings and sauces will be provided. 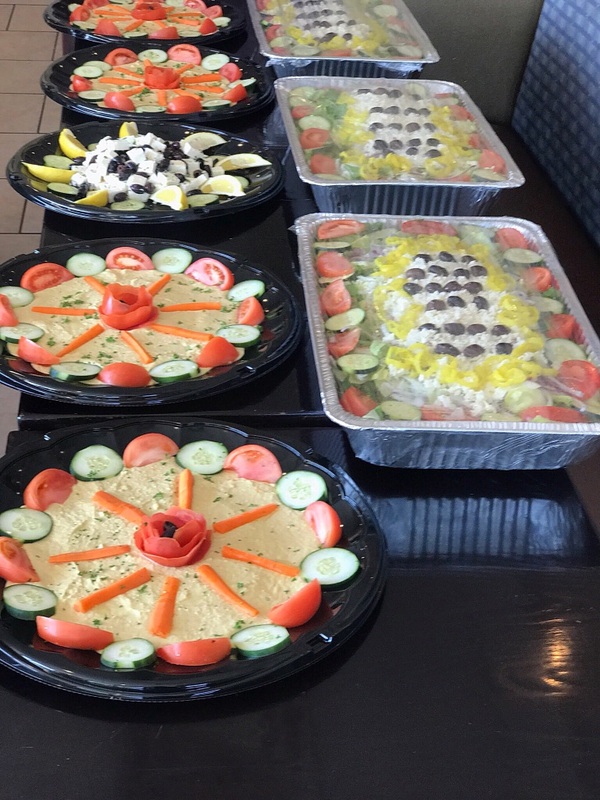 Served with pita bread, toppings, sauces, and Greek Salad. Greek Salad, Spanakopita, and Dolmathes. Grilled to perfection, served with rice pilaf, Greek Salad, and sauces. All white meat chicken fingers and high quality potatoes fried in pure vegetable oil. Fresh crispy lettuce, tomatoes, onions, cucumbers, peppers, Kalamata olives, feta cheese and your choice of house-made dressing. Fresh sliced tomatoes, cucumber, onions, peppers, Kalamata olives, topped with feta cheese and house-made vinaigrette dressing. A classic Greek party favorite! Add Grilled chicken or Sliced Gyro Meat to any of the salads for $2.00 per person/serving. The Spinach Pie is excellent! And the chicken soup is the best in town! Whenever I’am in Grandview, I have to go Greek Express!